The Huronia Stallions Varsity team improved to 1-1 on the season with a 24-12 victory over the Peterborough Wolverines. The Stallions once again were led by a stellar defensive performance that featured four interceptions from Cornerback Jordan Travis. Travis had three interceptions alone in the first quarter that ensured the Stallions got off to a fast start. The team posted an early 17-0 lead after those turnovers but found themselves clinging to a precarious 17-12 lead just before halftime. The game was then broken open on an electrifying 56-yard interception return touchdown by Defensive Halfback Chris Kenneweg with just 24 seconds left in the first half. Kenneweg nearly stepped out of bounds but exercised incredible body control by stopping on one leg and then sprinting down the sideline for the score. The touchdown was enabled by a devasting block by Zachary Kean. The Peterborough offence was under siege all game with Gavin Wallin, Zachariah Willems, and Andy Shrubsole all posting quarterback sacks. Kayden Peters forced a fumble that Owen MacLeod recovered. The Stallions defence also posted their second consecutive second half shutout. 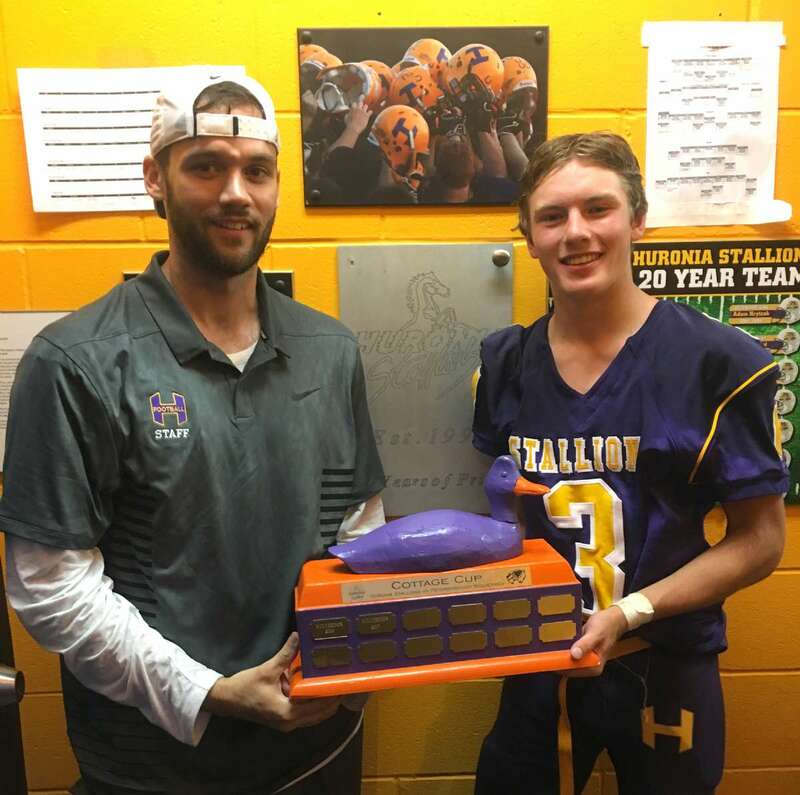 Offensively, the unit managed to move the ball more effectively this week with quarterback Justin Winn completing some nice downfield passes that gained the Stallions critical field position. Winn also connected on two scoring strikes to receivers Cruz Beaudry and Will McCulloch. Jordan Travis booted a field goal to round out the scoring. The win, alongside the Bantam victory earlier in the day secured two of the three games for the Stallions in their rivalry matchup with Peterborough. The two wins clinched the Cottage Cup trophy for the Stallions. The Stallions next game is this Saturday at 6pm at the Barrie Community Sports Complex in Midhurst against the Etobicoke Eagles. The Huronia Stallions Junior Varsity team lost 56-7 to the Peterborough Wolverines to fall to 0-2 on the season. The lone Stallions score was when quarterback Brayden Harkness hit Wide Receiver Justin Gausby for a first half touchdown. The touchdown made the score 14-7 but momentum was immediately seized back by Peterborough who took the ensuing kickoff to the house for a touchdown. The Stallions best defensive player was Victor Garcia who had two excellent open field tackles; one of which resulted in a forced fumble. The Stallions next game is this Saturday at 2pm at the Barrie Community Sports Complex in Midhurst against the Etobicoke Eagles. The Huronia Stallions Bantam team improved to 2-0 on the season with an impressive 38-18 victory over the Peterborough Wolverines. The Bantam squad was very motivated to achieve victory in the Cottage Cup showdown to set the tone for the day’s slate of games between the programs and to also avenge a lopsided defeat the previous season. The Wolverines took an early lead but it was short lived as the Stallions quickly seized the momentum and never looked back. Quarterback Will Howard had an outstanding game completely several long passes to Wide Receiver Mackenzie Johnson with the duo connecting for three touchdowns. The passing game was complemented by a great ground attack that saw Runningback Ethan Travis score two big touchdowns. Both phases of the offence were aided by strong offensive line play. The Stallions defence was tasked with shutting down a potent Peterborough run game. Defensive Tackle Jack Sheppard played stout defence all game and had a spectacular play where he stripped the ball from the Wolverine ball carrier and rumbled 30 yards for a defensive touchdown. Ricky Perri and Aaron Lavers had strong games at Linebacker for the Stallions defence and were supported by the sure tackling of Cam Taylor and Sean Deasy in the secondary. The Stallions next game is Sunday June 10 at Noon against the Etobicoke Eagles at the Barrie Community Sports Complex in Midhurst.